Instead of breaking down and predicting Top Rank’s headliner Saturday night, this article will focus squarely on year 1 of the Top Rank/ESPN deal. It’s hard to believe a year has pass since Manny Pacquiao and Jeff Horn fought outdoors in front of over 50,000 fans in Australia. Now that the ink is fully dried on the contracts let’s review the impact Top Rank’s had on a number of fronts. Has Top Rank’s departure from HBO and splash in to basic cable with the biggest sports outlet in the world lived up to expectations? We will cover the basis as far as exposure, quality control, and some improvements or adjustments that can be made. For a better part of 6 months, prior to the announcement of the partnership, Bob Arum was touting the next ten years as a major boon for boxing. Gone we’re the days of having to pay extra for quality fights and how the pay-per-view arm of the industry was basically depleted. Arum blamed everyone involved during the last heyday of boxing, including pointing the finger at the man in the mirror. The most established promoter on the planet, Arum was spewing beams of positivity to anyone with a smart phone or video camera. At first boxing twitter was somewhat disappointed with the matchup between Manny Pacquiao and unknown Jeff Horn. If we’re being honest, putting fandom aside Pacquiao was a perfect choice to kick off the deal. If you don’t think so the advertising and monster rating tells us it was a great move. The fight peaked well over 4 million viewers, as luck would have it the so-called crappy fight was very competitive. Well known fighters in the boxing community Vasili Lomachenko and Terrence Crawford both fought the following month in August. September featured Ramirez/Hart and Valdez/Servania which this hack-of-scribe still believes is the best Top Rank doubleheader thus far. They finished off the 2017 calendar with a high profile fight regardless of what anyone thinks of the weight difference in Loma/Rigo. 2018 started slow in February but picked up plenty of steam in March and April, some of that momentum carried in to May. The last few events on ESPN or ESPN+ have been lackluster to say the least. On the surface the events have been fairly good not great, but not horrible either. Obviously it’s still early in the 4-year agreement so let’s refrain from being straight fanboys by claiming ESPN is a savor, as well as criticizing every single card blindly. It’s been a mixed bag of stinkers and solid scraps, with a few great moments in between. After all the endless talk of exposure or lack of it on premium cable or PPV, Arum has fallen short to an extent. A few events have peaked over 2 million, some of it had to do with the lead-in, while a others were based off quality and actually increased beyond the previous broadcasts. Case in point would be Lomachenko/Rigondeaux, which had a tremendous base to begin with from the Heisman Trophy award show. On that night, boxing actually improved in rating peaking higher than the award show. As a whole, boxing has been talked about across several popular sports talk shows on ESPN in the long run that can only help. Lucky for us fans we haven’t had to throw down 60+ dollars for a PPV yet. It must be mention that random circumstances are the main reason. Crawford/Horn was originally slated for pay-per-view as was Pacquiao/Matthysse on July 14. Crawford’s injury (wink wink) and Manny’s promotional team dropping the ball by missing the deadline to inform the cable and satellite companies have saved us moola. So realistic we got a PPV on the schedule before an ABC prime time slot, something promised in the press release. We also were given an option to shell out minor doe for the ESPN+ streaming service. For all the negativity surrounding ESPN+ it’s super cheap and you can cancel anytime. ESPN+ is great for overseas fights & prospects or vets wanting to stay active. Crawford/Horn seemed like a great opportunity for at least regular ESPN if not on ABC. Jeff Horn was coming off a conversional victory on one of the biggest viewership boxing broadcasts since the 1990’s. Why wouldn’t you give Crawford, the guy Arum says is as good as Sugar Ray Leonard, that huge exposure? While we’re on the exposure topic, several lead-in broadcasts have been crucial to the success of a card regardless of the actual matchup. Also, it’s clear to see the bump in interest and chatter when an event is properly advertised & promoted fight week. It’s great that boxing on ESPN is not just a scroll on the bottom line with vague headlines. In the past it would take a huge name to create buzz on ESPN that is no longer the case. Top Rank is known for their matchmaking, whether moving a fighter from prospect to champion, or in-house fights. They pride themselves on knowing when it’s time to step up and when to move a boxer laterally. The one thing that stands out to me in the past is their ability to make a stay busy fights entertaining style-wise, the jury is still out to see if they can be more consistent on ESPN in that context. Top Rank has gotten the formula right several times in the main events. Lomachenko/Linares, Loma/Rigo, Valdez/Quigg, Ramirez/Hart, Crawford/Indongo, and Dogboe/Magdaleno we’re all good to great scraps or at least had meaning to help tell a story. With that said, there’s been too many showcase, one-sided main events. Don’t get me wrong, I get a fighter that wants to stay busy won’t face a murders row, but there’s no excuse for the last two opponents of Gilberto Ramirez. At least give us someone that has been battle tested and belongs in the ring at a contender level, let alone championship level. The undercard fights need improvement especially when it’s matched with a mediocre main event. Case in point would be last weekend’s war between Alex Saucedo and Lenny Zappavigna. Obviously you’re not going to get a FOTY every time, but a competitive bout goes a long way to the faithful viewers. Other than a run of the mill swing bout, undercards should consist of a prospect matched against a real test or closely-matched middle-level fights. As a whole we could use less of prospects in the early stages of a career fighting complete no-hope stiffs in a co-feature. Basically from top to bottom less squash matches please. Bottom line, if Top Rank has the budget of Showtime and HBO combined, as Arum claimed in an interview last week with Chris Mannix, then he has zero excuse to not produce a better, more consistent product. We expected this from the PBC’s Waddell and Reed money so let’s apply similar energy to this. The media has been especially nice for the most part amongst the top tier outlets. Many of the same media members (and part-time media) that crucified the PBC or HBO in recent times have been unsurprisingly quiet in the lead up to an overmatched headliner. Case in point, ESPN has back to back to back showcase-type main events. If the PBC did that especially in the first 18 months or so, they were routinely crushed for it. Even a fight like Garcia/Guerrero, a clear stay busy for Danny, was devoured on social media. It doesn’t matter if these types of matchups are entertaining or competitive, like DG vs. RG it still goes down as a bogus fight while other promoters get a pass at times. Meanwhile it did a great rating and as it turned out was a good fight around 8-4ish. Leading the way as far as high profile outlets, is Dan ‘Mr. Tell It Like It Is’ Rafael, who treads lightly using kids gloves in terms of criticism towards ESPN. Here’s a prime example, in February Dan gave a B- grade for the first show of the year featuring two easily identifiable mismatches Ramirez/Ahmed and Ancajas/Gonzalez. Not only would Rafael destroy the PBC about the actual fights, he would’ve ripped them for poor attendance as well. A grade of B- for a guy who loves to use the word putrid to describe certain fights is suspect to say the least. Maybe Teddy Atlas getting downgraded at ESPN has Dan shook, but he’s all of sudden not a tough-talker that keeps it real as it pertains to Top Rank’s product. 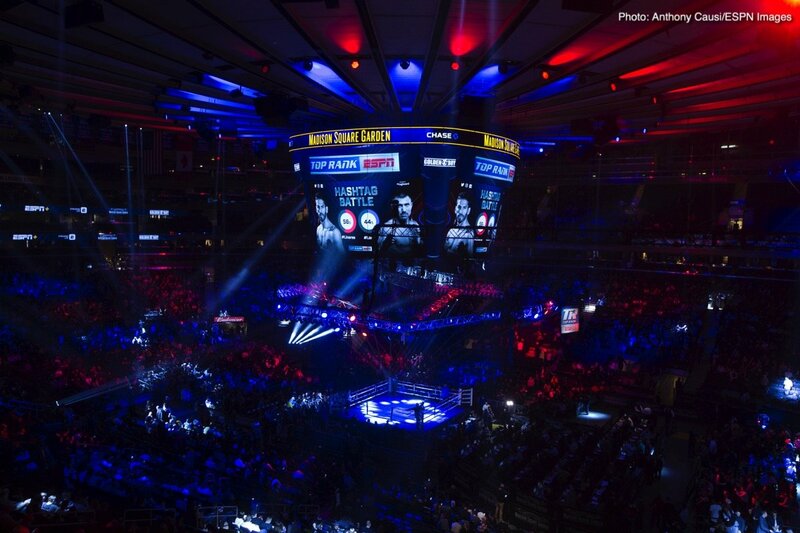 In fact as we approached late June/early July, featuring three in-a-row forgettable main events, Dan wrote about boxing taking a summer break, which was true several years back but hasn’t been the case in recent summers. I expect that behavior from the smaller outlets, part-time media or website owners who rely on event accessibility not just hits to a website. It’s not like Bob would ban Dan from ESPN events. When it comes to star-building Lomachenko has gotten the most exposure ratings wise and number of fights. Loma has 3 fights in around 10 months his fourth was scheduled in August if it weren’t for the injury to his shoulder. Both Jose Ramirez and Oscar Valdez have been active giving their profile a boost in the boxing world. Crawford has two fights with the last one coming on ESPN+ instead ESPN or better yet ABC. A few good story lines have come to light, for instance Rey Beltran and Isaac Dogboe. The next two shows and summer calendar is pretty weak, August 18th Jennings/Dimitrenko is okay. On paper it appears to be the dog days of summer showcase main events for Top Rank. On August 25th Beltran vs. Andreev not Pedraza, and Dogboe vs. Otake it’s suitable. The summer standout would be far and away Usyk/Gassiev if it were to land on ESPN+. Addressing the broadcast team, during the cards and especially post fights are downright horrific at times. Stephen A Smith and Teddy Atlas do serve a purpose for casuals or mainstream sports fans but its god awful having to hear these two scream over each other. Timothy Bradley and Mark Kriegel join long time veteran Joe Tessitore. No complaints about Joe, however the broadcast is now skewed sounding more and more like HBO. Too many times Tim and Mark are talking about the house fighter instead of commenting on what is happening right before their eyes. Timothy is green to an extent so he kind of gets a pass, but could calm down some to closer match his co-hosts energy, Mark is always trying to fit in a long winded back story that seems forced. All and all it’s only been a year, some of the issues we all had with the PBC were solved or at least changed a bit. We can’t ask for a spectacular event every time out but we can demand less walkover opposition on the b-side in the headliners and overall. A work in progress is fair, once late August hits, let’s see how they close the year out.